In 1994, a meeting was called in the San Antonio area for anyone interested in learning about olive trees and establishing a Texas Olive Oil Council for the new industry. A few of those attending thought it could be a hobby, and a majority of attendees, including agricultural experts from Texas A&M, said olives would never be viable in any form in Texas, much less an industry. A handful of Texans—a couple of ranchers, a few businessmen, and some modern day wildcatters decided to explore the idea and started planting in 1996. In 2001, the first harvest of Texas olive oil was pressed from a Dilley, Texas grove. Founding members of the Texas Olive Oil Council, Beverley and David Anderson, surprised everyone with a harvest of oil from their 5-year old grove of 6,400 trees. It wasn't a giant number of barrels—they pressed it themselves with a hobby press from Italy, but the production proved that growing olives for olive oil in Texas could be successful. Now, fourteen years later, these few believers are part of a nascent, but successful and expanding agricultural industry, a new kind of Texas oil boom. Since that time, the Texas olive industry has grown to include 25 serious olive producers, and 35 hobbyists, who grow olives for their personal use and interest. The most recent harvest of 2010 was a bumper crop year for these olive growers. They produced over 500 tons of olives throughout the state with revenues expected to gross over $3 million. A number of the growers plan to expand their groves with new trees this year, adding hundreds to their numbers and expanding this thriving agribusiness. It is predicted, as younger groves mature in three to four years, that the olive oil agriculture in Texas could become a $20-$25 million business. Last month, on March 26, 2011, many growers, producers, and a few new enthusiasts gathered for the First Annual Texas Olive Oil Tasting Festival. In a classic Texas-style celebration, over 200 people fill a “gas-station-turned-honky-tonk” restaurant, Threadgill’s, where a big screen projected multi-media of olive groves, producers, fruit, and bottled oils. The scene was reminiscent of a family reunion as everyone greeted one another with camaraderie, interest, and respect. Banter around the room was a continual exchange of information about the groves, concern for how the early, dry and warm weather will affect the 2011 harvests, the bud growth, parasites, and frost damage. The event’s tasting competition was an informal one to showcase the harvest and varieties. The tasting panel was a mix of prominent chefs, olive oil buyers and food writers; and international olive growers. Out of seventeen orchards represented, six commercial producers and six artisans submitted 30 bottles of oil. They competed against international olive oil producers from Argentina, Spain, and Italy. In the commercial producers category, an Italian olive oil from Partanna, Sicily claimed first place, but the Texas Olive Ranch’s Arbequina and its Koroneiki/Arbequina blend took second and third respectively. The owners of Texas Olive Ranch in Carrizo Springs are Jim Henry, a founder of the Texas Olive Oil Council and pioneer in the Texas branch of this industry, Karen Lee, PhD., a food entrepreneur and olive oil expert, and Jerry and Penny Farrell, who also own Farrell’s Olive Orchard in Artesia Springs. Texas Olive Ranch (TOR) maintains 40,000 trees; Farrell’s orchard has several thousand more trees. TOR harvested 350 tons of olives in 2010. These three leaders lend support and guidance to all the olive growers in the state. Texas growers swept the Artisan category. First place was awarded to Jewett Farms from Moulton. Dunham and Jill Jewett started growing olive trees as a hobby. They joke about creating a “little Provence” on their ranch in the coastal plain of Texas. Their grove of one thousand trees produced award-winning oil from its first harvest. They picked 1,600 pounds and pressed twenty-three gallons. Dunham Jewett says their grove is at “the back of the fray” of olive growing, but after receiving the praise at this festival, Jewett feels more like a contender. Another artisan grower, Bel-Asher Groves from Asherton took second place with an extra virgin olive oil from some of the oldest olive trees in the region, planted in 1914. The original orchard was created during a boom time for the town, during the pre-Depression era, and was harvested for table olives but disappeared from use during the bust that followed. Quaglia Orchard from Del Rio filled the third place in this category with its extra virgin olive oil from a smaller, 400-tree harvest. Qualia Orchard is part of the oldest vineyard in the state: Val Verde Winery, which began in 1883. Tom and Linda Qualia, third generation vintners, decided to experiment with olives in the Del Rio area since grapes do so well. Festival attendees also welcomed a kindred spirit from south of the border to the event, Sr. Jesus-Maria Ramon-Valdez. A newcomer to the olive growing business, Sr. Ramon-Valdez, is a Senator from the state of Coahuila, Mexico who visited the festival to meet the growers. He plans to join their ranks by starting olive groves in Mexico. The Texas Olive Oil Council is assisting Ramon-Valdez with a grove of 25,000 trees planted on Rancho La Espiga’s spring-fed land. It is just past the Del Rio, Texas border in Acuna, Mexico. This expansion of the industry represents a real victory for the industry. The Senator, his government, and the United States hope it will contribute to the positive economic development needed in the area. A Texas A&M scientist and owner of Charta Olive Farms, Jeff Transeau, also joined the evening. He began his love affair with olives in 2003 as an artisan grower to produce oil for personal consumption. As a biologist, he recognized an opportunity to develop olive trees that could grow in the different climates from Arizona to Florida. His olive farm produces trees for groves across these states, selling tens of thousands of trees a year. Charta handles forty-nine varieties of olive trees, developed from collected mother stock of Africa, Tunisia, Israel, Italy, Spain, Greece, Portugal, and Jordan. His devotion to this tree not only creates successful regionalized adaptations for different varietals, but expands to an innovative fungi inoculation that assists olive trees in avoiding drought. 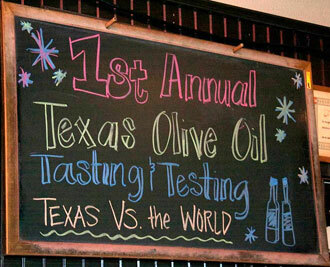 The First Annual Olive Tasting Festival organizers boasted that its celebration was “Texas Olive Oil vs. the World.” It is a tongue-in-cheek battle cry that demonstrates the spirit of avid enthusiasts. This group of old and young ranchers and olive growers, all caught up in the enthusiasm for olives, are devoted to the tree’s mystery, its fruit and juice, and the passion that surrounds this mythic plant. They have found a new frontier to claim and introduce to the world. Just like other Texan artists and innovators, they intend to make their mark.